There wasn't exactly high-speed Internet and streaming video aboard luxury ocean liners like the Titanic, yet these ships were stocked with amenities to keep passengers occupied during transatlantic voyages that typically lasted about 5-9 days. A century later, our chaotic, over-saturated noggins might be bored to tears. Opulent and fashionable, the Titanic, which was the creme della creme in 1912, spared no frills, including a gymnasium, a squash court, and a swimming pool—the first ever to appear on a boat. The delicious fare served onboard the ship was no excuse to pack on the pounds; the gym even had an an electric camel, electric horse, and cycling and rowing machines. After sweating it out, passengers were probably a little sore, so they could head to the Turkish bath where there was a steam room, a sauna, and electric beds, the 1912 version of a tanning bed. They could also cruise the ship's protected promenades, two 50-foot walkways located on either side of the ship. Similarly, the RMS Mauretania had a Verandah Cafe where people could have a coffee, insulated from the chill of the Atlantic. But none of this mattered if you weren't riding in style in first class. For the record, one of these tickets cost $2,500, which amounts to around $57,000 in today's dollars. Suites were more expensive—the equivalent of around $103,000. While in 1912, the Titanic was the most extravagant beast to brave the seas, much of the onboard entertainment was standard, it was just presented in a more elaborate package. Second- and first-class passengers alike could play games like shuffleboard and ring toss and boardgames like backgammon and chess. But the lesser of these two classes was relegated to the boat deck to do so. There would have been chairs and chaises for lounging, though most of the furniture on these liners was bolted to the ground. The third class didn't have many formal activities, but honestly, it sounds far more fun and loads less stuffy. That famous scene in Titanic where (spoiler alert!) Jack and Rose dance to tunes played by a band in steerage? Something like that very well may have happened. These mostly-immigrant passengers were confined to their sub-par lodgings, where they had to make due with what they had, meaning it was a hotbed of drinking and gambling. Though there were ways to occupy yourself, transatlantic treks were monotonous. Reading was, of course a centerpiece of leisure, with libraries and dedicated reading and writing rooms standard on most ships. Though, like most everything, there were separate facilities for each class—and steerage passengers were just SOL. Men-only smoking rooms, as well as gender-specific lounges were also standard, a nod to the fact that socializing was one of the main time-killers on the sea. Guys would jabber into the early hours of the morning over cigars and booze, while women would chat, knitting and playing cards in their respective haunts. Dining—especially supper—was an event in and of itself. 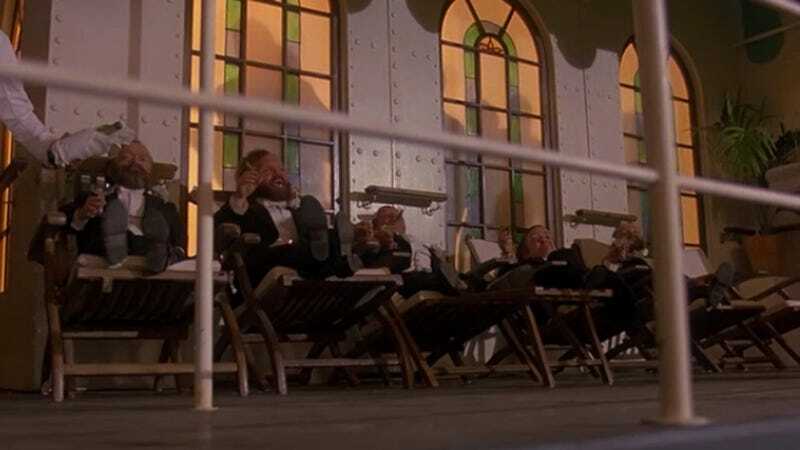 On both the Titanic and the Olympic, the ill-fated steamer's sister ship, first-class passengers would first gather on the elaborate grand staircases of the ship to meet one another, and take their socializing into a reception room before the meal. Music was involved in all of these activities, with orchestras playing throughout. Often there would be dancing. The orchestra on the Titanic, as legend has it, continued to play as the ship was sinking.